McKinnis Cache biface with edge-to-edge flake removal. This early stage biface represents one of the 11 bifaces (see McKinnis cache) that were discovered during a land leveling operation in St. Louis County, Missouri. It's an early stage biface that illustrates "classic" Clovis flake removal scars. This biface is most impressive for its edge-to-edge or "outre passe" style of flaking. One side has a large edge-to-edge flake scar that removed 1 1/2 inches (3.8 cm) of the opposite edge. This is a lithic technology that was no longer traditionally used in post-Clovis cultures. The intended purpose for this early stage preform was probably to make a fluted point. This biface is made of Burlington chert and measures 4 5/16 inches (11 cm) long, 1 11/16 inches (4.3 cm) wide and 7/16 inch (1.1 cm) wide. The McKinnis cache was discovered in 1996 on land that was being leveled for houses. The cache contained 11 bifaces and 12 core blades. The site is located on a hill top within 2 miles of the Missouri River in St. Louis County, Missouri. This cache was made with stone tool manufacturing technology that relates to the Clovis culture. The largest artifact in the cache is a basally thinned late stage Clovis point preform. A base of a Clovis point was also found near this cache. 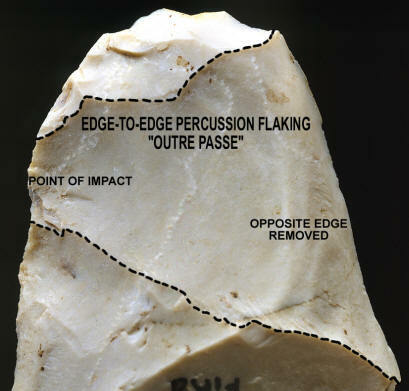 This picture shows a close-up view of the over shot percussion flake scar on the biface pictured above. This is an excellent example of a Clovis technology break pattern that is often found on Clovis camp and manufacturing sites. Over shot flakes are referred to as either edge-to-edge or "outre passe" types of flake removals. This flintknapping technique represents an important diagnostic element of Clovis stone tool manufacturing technology. These unique and fairly rare types of flake removals help archaeologists identify Clovis sites. This biface is made of Burlington chert and it measures 4 5/16 inches (11 cm) long, 1 11/16 inches (4.3 cm) wide and 7/16 inch (1.1 cm) wide.